This article discusses portfolio growth potential for BDCs without the need to issue additional shares. 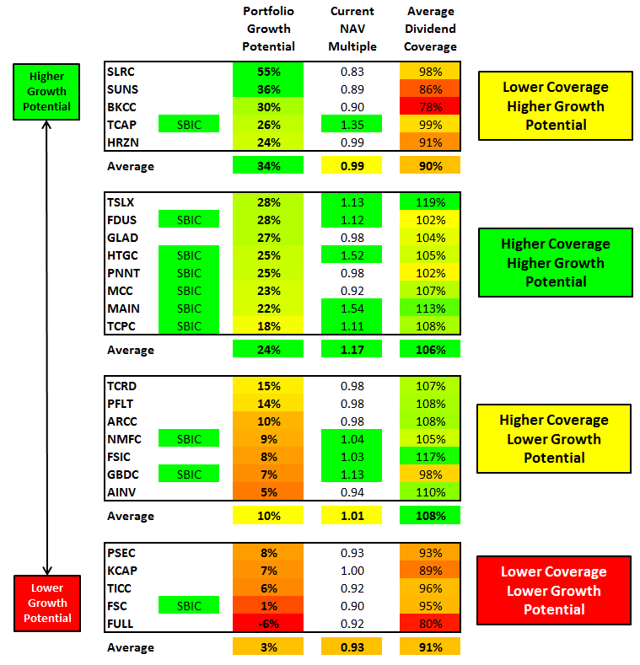 BDCs with higher growth potential and dividend coverage trade at a premium. BDCs with less growth capital and dividend coverage are trading at a discount to NAV and not able to raise equity capital. This article discusses BDC portfolio growth potential related to the coverage of dividends. Some BDCs have been combating portfolio yield compression, as discussed in "BDC Market Update: Yield Compression", by using increased amounts of borrowings as discussed in "BDC Market Update: Leverage". The following table uses a similar methodology as my previous articles to estimate the amount of potential portfolio growth using similar amounts of leverage, available cash and without issuing new shares. I have assumed a debt-to-equity ratio of 0.85 that is above the current industry average. For BDCs with a license to operate a Small Business Investment Company ("SBIC") subsidiary, I have assumed slightly higher amounts of leverage due to having Small Business Administration ("SBA") debentures that are excluded from BDC leverage ratios. I have included the average amount of dividend coverage over the last six quarters. For dividend coverage purposes I use core net investment income ("NII") that can be different from reported EPS for some BDCs because it excludes both income and incentive fees related to capital gains as well as some of the major onetime expenses, including fees related to amending debt facilities. I also do not include excise tax expense for BDCs such as Ares Capital (NASDAQ:ARCC) and PennantPark Floating Rate Capital (NASDAQ:PFLT) because these expenses can be considered temporarily related to the dividend policy. I believe core NII is a more accurate measurement of recurring income to cover dividends. The BDCs are generally ranked by portfolio growth potential without the need to issue additional shares. I have grouped them by dividend coverage to show which BDCs have higher or lower growth potential compared to need for portfolio growth to cover dividends. The first group includes companies that have lower dividend coverage but a higher potential for growth. BDCs with lower amounts of leverage like Solar Capital (NASDAQ:SLRC), Solar Senior Capital (NASDAQ:SUNS) and BlackRock Kelso Capital (NASDAQ:BKCC) may experience lower dividend coverage until they can utilize their capital. Triangle Capital (NYSE:TCAP-OLD) is in this group as well but has an SBIC license and Horizon Technology Finance (NASDAQ:HRZN) recently received a "green light" letter to continue its application process to obtain a license to form and operate an SBIC subsidiary. I believe that the second group is the best positioned for growth and dividend coverage, especially the BDCs that are trading at a premium to net asset value ("NAV") including TPG Specialty Lending (NYSE:TSLX), Fidus Investment (NASDAQ:FDUS), Hercules Technology Growth Capital (NYSE:HTGC), Main Street Capital (NYSE:MAIN) and TCP Capital (NASDAQ:TCPC). Obviously investors pay higher multiples for companies with an increased ability to cover dividends. The information in this article does not include the recent shares issued by FDUS at a premium to its NAV per share. Medley Capital (NYSE:MCC) also had an equity offering since the most recently reported results. The third group has higher dividend coverage but lower growth capital available. However New Mountain Finance (NYSE:NMFC), FS Investment Corp (NYSE:FSIC-OLD) and Golub Capital BDC (NASDAQ:GBDC) have stock prices trading at a premium and NMFC and GBDC have SBIC licenses. NMFC has also issued shares at a premium to its NAV since the most recently reported results. The last group is the one that investors should be concerned about for a number of reasons including less access to capital and lower dividend coverage as well as lower trading multiples. KCAP Financial (KCAP) has a lower operating cost structure due to being an internally managed BDC that usually trades at a higher multiple to NAV and has recently issued shares at a premium. Fifth Street Finance (FSC) has an SBIC license but also had a much higher than average debt-to-equity ratio before its most recent equity offering. Prospect Capital (NASDAQ:PSEC) has been using increased amounts of leverage each quarter and currently has a debt-to-equity ratio of 0.85 but also has $488 million in cash and has been issuing shares below NAV. "During the period from September 26, 2014 through October 29, 2014 (with settlement dates of October 1, 2014 to November 3, 2014), we sold 3,954,195 shares of our common stock at an average price of $9.76 per share, and raised $38,574 of gross proceeds, under the ATM Program. Net proceeds were $38,377 after commissions to the broker-dealer on shares sold and offering costs." Basically PSEC received net proceeds of $9.71 per share compared to the current NAV per share of $10.47. If the company continues to abuse its ATM program to grow the portfolio it will be at the expense of the shareholders in a few ways that I will cover in future articles. The company has also announced that it is spinning off some of its higher yielding assets that it can use for capital in the coming quarters, but it will need to replace the yield from those investments and will most likely continue to have dividend coverage issues in the long term. On the other hand, TICC Capital (TICC) reported an increase in its portfolio yield and almost covered its dividend. For more information about growth capital and dividend coverage please see my "BDC Research Page" and for information on specific BDCs please visit my "Index to BDC Articles". Disclosure: The author is long TSLX, HTGC, MAIN, TCPC, PFLT, TCAP, NMFC, FSIC. The author wrote this article themselves, and it expresses their own opinions. The author is not receiving compensation for it (other than from Seeking Alpha). The author has no business relationship with any company whose stock is mentioned in this article.